Be enthralled by the wonderful masterpieces kept inside the Uffizi Gallery and discover interesting anecdotes! Most of us are going to the Uffizi museum to see masterpieces such as The Birth of Venus and the Allegory of Spring by Botticelli. Yesterday I discovered an interesting story behind a painting I hadn’t noticed. 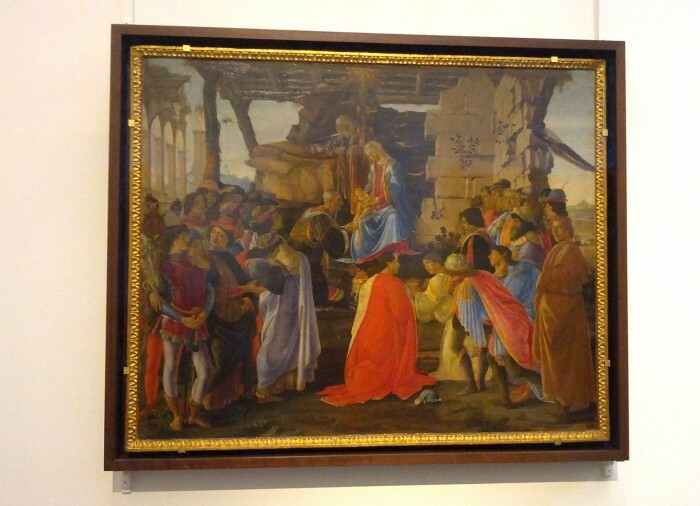 The Adoration of the Magi was painted by Botticelli around 1475, so before the two jewels I mentioned. First of all there’s a beautiful self-portrait of the artist, on the right side of the painting: Botticelli is looking at us, dressed in ochre. Looking carefully you’ll see other two people staring at the viewer. The men with grey hair is the patron, Gasparre di Zanobi del Lama, who commissioned the painting for his altar in Santa Maria Novella church. The other character, a young man on the left, almost in the background, is supposed to be a member of the patron’s family. Gasparre, in fact, was an influential banker who had close connections with the Medici family, that’s why he commissioned this painting to Botticelli, combining the religious theme with politics. Don’t forget that one of the magi’s name was Gaspare! The painter portrayed here many members of the Medici family. At the centre of the painting we’ve the holy scene, Mary with the baby Jesus and next to them, dressed in black, there’s Cosimo the Elder, patriarch of the Medici family, the only having the big honour to touch Jesus’ foot. Cosimo’s eldest son, Piero the Gouty, is kneeling in the centre, with his brother Giovanni on his right side, in white. Cosimo, Piero and Giovanni had all died in 1460s. One of Piero’s sons, Giuliano – the handsome young man dressed in black stands on the right, in profile – will soon be murdered in the Pazzi’s Conspiracy in 1478. We all heard speaking about his brother, Lorenzo the Magnificent, portrayed on the extreme left of the painting, embraced by Pico della Mirandola, while the sophisticated man of letters Agnolo Poliziano is talking to him. Poliziano himself had written “Le Stanze” (“The Rooms”) in honour of Giuliano the Medici, who had won a tournament, making a homage to the beauty of Simonetta Vespucci, the Venus all Florentine fell in love with…but this is another story! My favourite ones are single museum tours, lasting maximum 2 hours: my attention doesn’t drop and when the tour ends I can stay longer inside the museum to see what I prefer. Book here your Guided Visit of the Uffizi Gallery and admire the wonderful masterpieces kept inside this world-famous museum! 61 queries in 0.869 seconds.